One would think that the only vegetable my husband knows to exist is cabbage and potatoes. I swear to God we have the same conversation every week and will probably continue to do so until someone takes the initiative to stop asking hence ending the vicious cycle. I don’t know why he’s obsessed with cabbage. Maybe it reminds him of when he was living in Henan, China and survived on a diet of what he described as ‘scraps and cabbage’. All I know is that sometimes I cave and yes, we eat cabbage. BUT, how do you make it tasty? How can you spice it up and elevate past the tried and true method of just boiling it? The answer-go with your French cooking instincts. Go with wine and thyme. I swear that combination can make anything taste good. ANYTHING! Even the humble cabbage. This is a simple, easy to make, easy to prepare, quick to cook and tasty vegetable side dish. I love the color and it pairs great with a roast. AND YES, it shuts up the cabbage-craving monster. Wash and peel away any undesirable outer leaves. Cut cabbage into quarters and remove the core. Cut cabbage into 1cm/0.5in strips. In a large wok or frying pan, melt butter over medium heat. Add garlic and thyme and cook until fragrant being careful not to burn the garlic (usually 1-2 min). Add wine, increase heat and bring to a gentle boil. Let boil for 2-3 minutes until alcohol is cooked off and mixture has reduced slightly. Add chopped cabbage and cook on high heat for 3-5 minutes or until cabbage is cooked to a point where it is crisp but not too soft. Season with salt and pepper to taste. Cut cabbage into 1 cm/0.5 in strips. In a large wok or frying pan, melt butter over medium heat. Add garlic and thyme and cook until fragrant being careful not to burn the garlic (usually 1-2 min). Add wine, increase heat and bring to a gentle boil. Let boil for 2-3 minutes until alcohol is cooked off and mixture has reduced slightly. 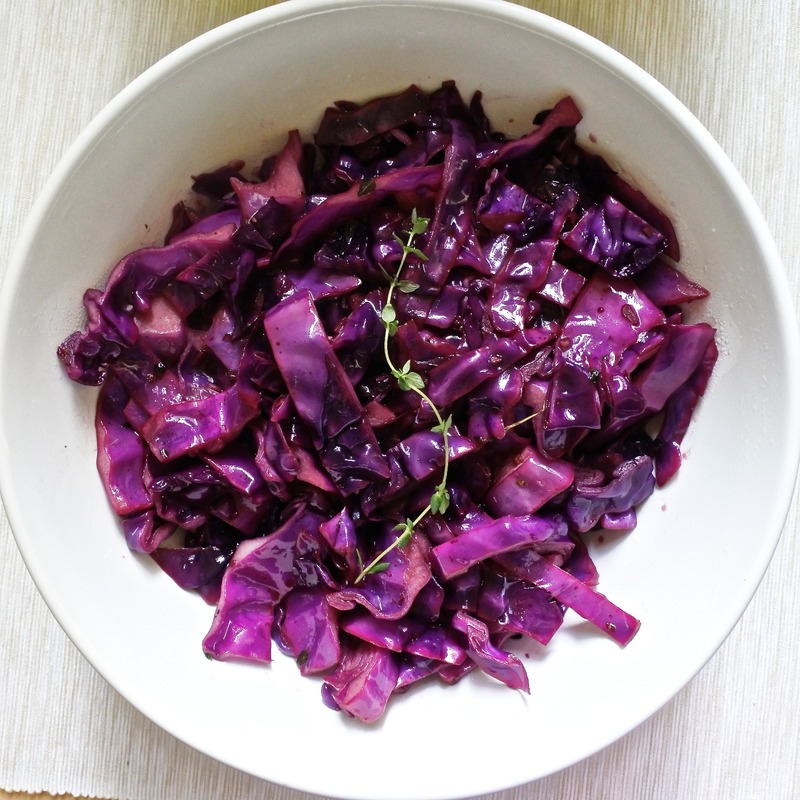 Add chopped cabbage and cook on high heat for 3-5 minutes or until cabbage is cooked to a point where it is crisp but not too soft.